Jambavan Dasa joined ISKCON in Detroit in 1994 and took initiation from H.H. Bhakti Tirtha Swami in 1995. 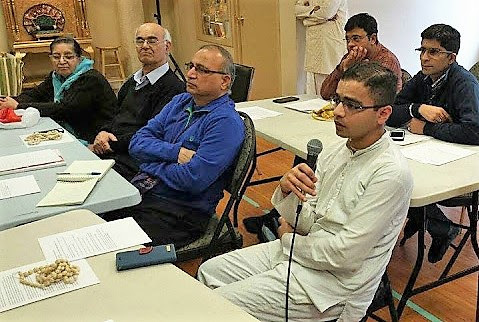 Within ISKCON, he has served as a book distributor, pujari, manager, and speaker in Detroit, Gita-nagari, Potomac, and in India. He and his family now are a part of the Harmony Collective devotee community in Ypsilanti, Michigan. Outside of the institution, he has worked mainly in banking, and he has a Bachelor's degree in Finance. He recently completed a second degree in English so that he can teach as well. He studied Sanskrit for many years under the instruction of H.H. Gopiparanadhana Prabhu and has translated much of Sri Visnu Purana and multiple other smaller works. He and his wife Samvit dasi have 8 children who are educated at home, the oldest is now at college. Jambavan currently works as a High School English teacher and frequently travels to perform weddings and other yajnas, with help from his sons.